Thanks for the reply. I understand that the Elite (if it ever comes to be a product) is in a whole different league than the 5n1 or the Atlas 7/8 and the comparable competitors When I buy, I will be evaluating the Elite against the Davis Vantage Pro2, not the "all in one" integrated sensor arrays, especially considering the "leaked" price of $599 for the Elite. That is probably where my main interest is, and I truly wish Acurite would give us some indication of product details, prices and availabilty. I am a very patient person if I have some information to work with, but Acurite's refusal to provide detailed information about the Atlas series is getting pretty old. It is good to know that the build quality of the 7/8 series is that much better than the 5n1, so thanks for making that distinction. I guess time will tell (after 2 or 3 years of service) if that adds sufficient value to that series to distinguish it from the 5n1 series. That said, it still makes me wonder if Acurite will continue to sell and support the 5n1 series for very long after the Atlas 7/8 is released since functionally they appear to be more or less equivalent. I suppose a substantial price differential could work for them to keep both model series viable. But using your car analogy... think about Cadillac, Buick, Oldsmobile, Pontiac, Chevy. We know how that turned out. With all the bad press with Acurite, I would go with the Ambient Falcon except for one thing ... no aspirating fan option. Knowing my siting options, I think it would be a big mistake to buy something that doesn't have at least a daytime fan. I know Davis has the best brand reputation, but in my opinion it is overpriced and terribly outdated in its convoluted configurations for uplinks, fan and display. So unless they come out with something new, Davis is crossed off my list. That is why I still wait to see what opportunities the Atlas will provide. I am more than willing to pay the price (within reason of course) if I can get a high quality product with the features I want. The Atlas looks promising, but like I said ... how long should I wait when month after month Acurite gives us nothing for information about the product. "Coming Soon" displayed on their web site for 14 months without incremental details just doesn't cut it. As a newbie in weather stations, your collection of them has room to grow. I have stations from three different manufacturers here, and was just asked to put up a fourth mast. If you are committed to the Acu-Rite ecosystem, why not pick up a 5-in-1 now? If/when the Atlas ships, pass the 5-in-1 along to someone else or run it parallel with the Atlas for a backup/second opinion. Don't worry too much about the station having a "fan". It doesn't make up for poor siting, and in my experience, can make the readings worse if the thermometer is improperly installed. When you buy an "all in one", you are basically siting for the temperature and rain gauge... Forget the wind. I have a different view-- Without a fan or a really top-notch auxiliary heat shield (I don't think there are any for the 5 in 1 unit) you are going to get totally erroneous temp spikes as soon as the sun hits the un-aspirated 5 in 1 unit. On the other hand, an aspirated 5 in 1 unit can give pretty accurate temps at the expense of getting wind data from the NWS officially recommended 33' mounting height. The typical lower mounting of the 5 in 1 will however give you local micro-climate data on the wind in and around where you are living/walking. IMHO, the Davis VP2 looks like it's from the Atari era. The other problem is they charge $200 extra for a IP dongle to connect to the router and if you can't locate the console next to the router you need to string ethernet cable or buy a separate console. The Davis solution is a kludge IMHO. They need a new color console with integrated WiFi. I disagree. I have an Excelvan / Fine Offset wh-2310 weather station with USB hooked to my meteobridge to send to the national wx service, and it is more accurate than the 5in1 with a fan. All I did was use some reflective heat shield that you put under roofs as the way to keep the sun off the stock shield. I have three rings of it on there that I cut to fit. I posted a pic at one time in the wx pics section. DoctorKnow, I was referring to 5-in-1 type units. It would be hard to shield a 5-in-1 like you did with your WH-2310. 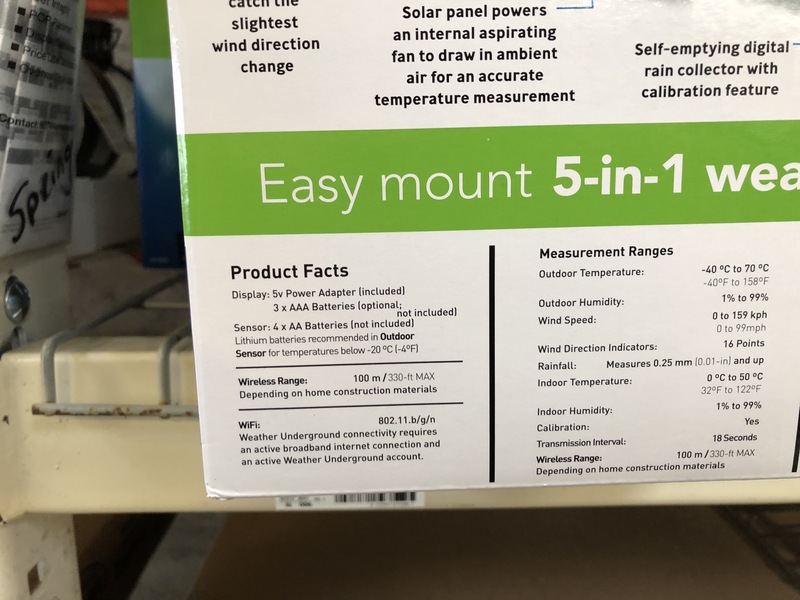 No 5-in-1 is an optimal design although the Elite is supposed to allow for separating the anemometer which would go a long way to improve the design limitations of the older Acurite models. (Don't you have an Atlas test model? Did you set it up with the anemometer kit? How is the temp accuracy of the aspirated Atlas as compared to the WH-2310? I don't have the anemometer kit, they didn't send one for testing. The thermometer on the Atlas runs 2 F more in the day and 2 F lower at night or so. I don't have the thermometers installed close to each other, so it is hard to say this is a good comparison, but I like the result of the WH-2310. If you don't shield the thermometer, the highs in the day on it are up to 10 F too high. Certainly have seen that here for people who are a bit more serious about the hobby. I have to imagine for most average backyard weather users, a basic station is just fine. If it doesn't work after a period of time, they either replace it or just let it be. I was at Home Depot today, and took a stroll through the seasonal department. The $99 deal that was on their web site is most indeed the new wifi model! As tempting as it was to buy it on the spot if for no other reason than to hack it up, I remembered my vow from a while back to never buy another piece of equipment in the Acu-Rite ecosystem so I put it back onto the shelf and kept on shopping. Unfortunately, I succumbed to temptation a few seconds later, and purchased an Acu-Rite product. Does anyone know how to get the $1.98 Acu-Rite 00866HDSB glass rain gauge to automatically upload to WU????? Good deal thanks for the heads up? I usually go to Lowe's rather than Home Depot, but I decided to stop by today to see if they had this Acurite model after reading vreihen's post. I couldn't find it anywhere. I decided to look for rain gauges. Same deal. Nowhere. I decided to look for thermometers. Again. Nowhere. I thought I was going nuts. 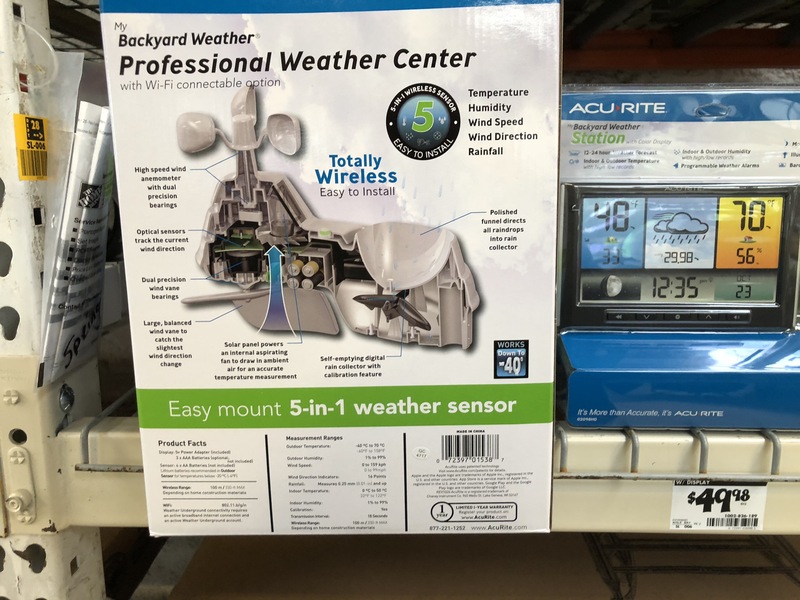 How can a hardware store not carry rain gauges or thermometers? I asked a couple of Home Depot employees... "We have no rain gauges in this store." "We don't have thermometers, but we have thermostats." I guess that's why I usually go to Lowe's. I did see a plant I liked in the garden center, though, so I bought that. I must have a really sucky local Home Depot. I just checked the website, and the Acurite is not there. I also checked thermometers and rain gauges. Not at that store, either. Weird. The website shows them at other Home Depots in town, though. Might be a regional thing. They are not in stock here in central California either. I understand that this 5n1 wireless commuincates directly with WU with no dependence on My Acurite. I assume that means that it will not commuincate with My Acurite. So does that mean the display is the only way to see your indoor temp/humidity and that information is not available from a computer or phone? In a related question, I know that connectivity to My Acurite is included with the yet-to-be-released Atlas Elite. Do we know that the Elite will also communicate directly to WU or other reporting sites? Or will the Elite be dependent on My Acurite to report to WU in the same way the Access/smarthub connected devices do? Most likely. Displays don't send their indoor temp/humidity to myAcurite now, anyway. We don't know for sure if the Elite sends data to myAcurite. It's just an assumption that it will. The Access and SmartHUB both send data directly to wunderground now. Their dependence on myAcurite is to manage the device settings, and in the case of the SmartHUB, keep the time set correctly (as the SmartHUB has no clock). Also, the SmartHUB wants to know that myAcurite is there, otherwise it resets trying to re-establish communications. I'm not sure if that is also true with the Access or not (well... it's not true for at least 12 hours). Obviously that is not true with the recent display. Thanks for the clarifications George. 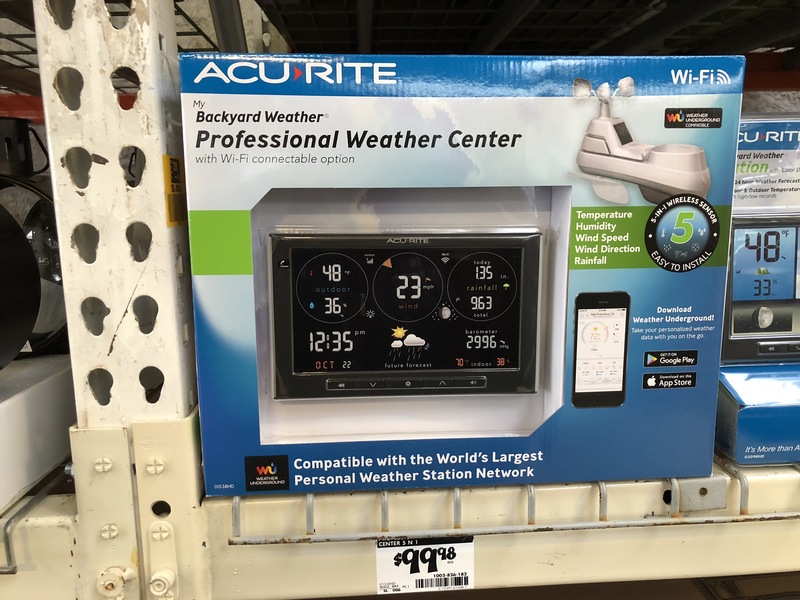 The spec sheet Acurite published on the Atlas Elite a year ago has this bullet point: "Share environmental data online that you can access anywhere with My AcuRiteTM using the Atlas Elite indoor display to connect to your wireless network." I suppose they could have changed their mind on that though. Oh. I missed that one. I guess myAcurite connectivity is more than an assumption, then. So, my questions are, how often does the display unit transmit data to WU? Does it support multiple sensors? Do we have any control over over the WU data other than turning it off or on? I think this is a fantastic option by the way!!! It doesn't seem to say specifically in the documentation, but I would expect it to be sending rapid-fire to wunderground every 18 seconds. It's possible it might be 36-seconds, though... it just depends on how they programmed it. It seems to support only one sensor... the 5n1. There are no other wunderground controls that I know of other than entering the Station ID and key. You have to set your wunderground station up beforehand with the detailed specifics. I'm thinking bad signal issues are going to be more of an issue with the 5n1 to Wi-Fi display, most people I think will have it centered in a living room type area NOT close to a outside wall or window like I think most do with the bridge/Access to receive the best sig. possible. Here is the one I bought. I got it for $80 on cyber Monday. I have the sensor suite (5-n-1 with single solar screen) mounted 175 feet away from my living room. This seems to be the upper limit for wireless range. I can literally look out the window to the point that the display and the 5-n-1 are both in eye sight at the same time. Yet, my reception indicator goes from "no bars" to "4 bars" and everything in between on a repetitive basis. It's performing OK for now, but it will freeze and not receive an update for minutes at a time sometimes. When I move it to my bedroom it is 150 feet away from the 5-n-1 and then I have no reception issues. That's why I think I'm on the upper end of range. This is about HALF of what they advertise in perfect conditions. Something to take into account. WiFi connection was a BREEZE. I was reporting to WU in minutes, and I've never had an online station before! Very easy! My router is in the attic and I'm on the 1st floor, so my signal strength is about half scale to quarter scale on the display most of the time. Still, there have been zero issues reporting to WU so far. WU updates are every 18 seconds or less it seems. Accuracy is high when it's cloudy or the sun is set. When the sun is shining, the temperature is affected pretty bad. I've seen it as much as 5 degrees too high compared to my VP2 and the nearby mesonet sites. Keep in mind that it's winter. So, during summer there is no telling how inaccurate this thing is going to be. I have it mounted perfectly level, roughly 12 feet above grassy surface, with the solar panel facing due south. Seems to me that the aspirating fan doesn't help this unit any. Wind readings have been very good so far. I did the calibration for the rain gauge and got it very close, but haven't tested it in a rain event yet. Will do that this weekend. The display is beautiful and simple to use. However, my BIG complaint is that there is no battery backup. This is terrible. Everytime the power goes out, or I need to move the display to another room I have to go back through and reset all my settings. Why couldn't they put battery backup on this???? Also, the screen is way too bright. Even on the very lowest settings, it'll light up the entire bedroom and prevent you from sleeping. They really need to work on this. Overall, for $80 I feel it was a good deal. I would not pay full retail for this station, but if you can get it at a discount it's a nice secondary unit just to get some data online quickly without fooling around with Access and other things. Page created in 0.071 seconds with 50 queries.